A dolphin has come to the rescue of two whales which had become stranded on a beach in New Zealand. 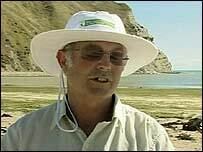 Conservation officer Malcolm Smith told the BBC that he and a group of other people had tried in vain for an hour and a half to get the whales to sea. The pygmy sperm whales had repeatedly beached, and both they and the humans were tired and set to give up, he said. But then the dolphin appeared, communicated with the whales, and led them to safety. 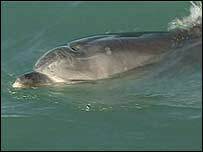 The bottlenose dolphin, called Moko by local residents, is well known for playing with swimmers off Mahia beach on the east coast of the North Island. Mr Smith said that just when his team was flagging, the dolphin showed up and made straight for them. "I shouldn't do this I know, we are meant to remain scientific," Mr Smith said, "but I actually went into the water with the dolphin and gave it a pat afterwards because she really did save the day."